It’s been a long, long hot summer. Feels like we’re in for a hurricane this fall for sure. But while school is out and the kids are stuck inside, I’ve been giving more thought lately to making some appealing snacks that are healthier than the fast food choices Bryce prefers for lunch. Thought I would share this one, because it’s so pretty it can double as a quick appetizer for parties – and best of all, the ham rolls freeze beautifully for use on the spur of the moment and they do well in a lunch box, too. 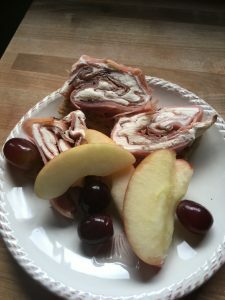 This little plate lunch is just 3 ham and cream cheese rolls, and I opened a bag of sliced apples and grapes that you can buy already packaged this way – a total cheat, but I’m a huge fan of easy meals in summer time. On wax paper, lay out very thin sliced deli ham (I like Black Forest, cut from the bone) in a layer of two pieces at a time, overlapping each other to form one continuous layer of ham about 12 inches long and 6 inches wide. In a bowl, use two bars of softened cream cheese, mix with a tiny bit of garlic powder and 1 tbsp Worchestershire sauce. Mix thoroughly and spread in a layer over the ham (about the thickness of frosting a cake). Add another layer of ham. Add another layer of cream cheese. Two layers of each is plenty. Then roll it all up length-wise, in a firm roll. The cream cheese will stick to the ham, so it’s pretty easy to do. Then wrap the wax paper around it and stick it in the freezer for 45 minutes. Once it is semi-frozen, it’s super easy to cut right through the wax paper, about 1/2 inch slices. Just cut off the amount you want to serve, then wrap the open end and freeze the rest for another time. ** I froze two rolls like this for about a month, then thawed them about half way and sliced, and they were still perfect to serve… so you can do this ahead and use any time. 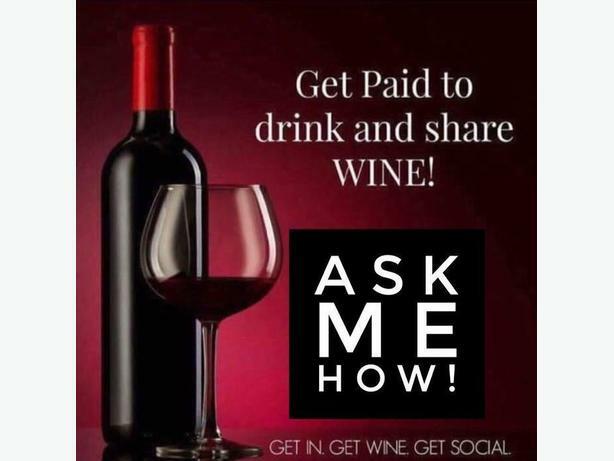 ‹ But How Do I Get the Wine?